Friends’ Annual Gala: Mardi Gras! 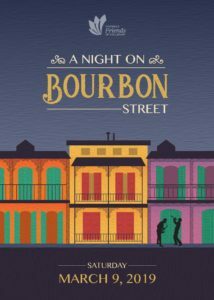 Join the Peninsula Friends of the Library for a “Night on Bourbon Street,” March 9, 2019. Enjoy an evening of delicious regional food and toe-tapping music. Laissez les bons temps rouler! (Let the good times roll!) This is the Friends’ annual fundraiser. With your support we are able to give special funding to the Palos Verdes Library District each year. The party will be happening at the Peninsula Center Library, with food supplied by Primal Alchemy, the first Southern California chef-owned, food-forward catering company focusing on local, seasonal cuisine utilizing sustainable practices. The New Orleans Traditional Jazz Band featured at Disneyland and in TV ads will provide the entertainment. We look forward to seeing you and celebrating our community! Click here for details.